Rapid prototyping processes can be used to create models of your product ideas and inventions. Prototypes are useful for proving that a concept works like you imagine that it will. Many times when you come up with an idea and then test it, you find that it doesn't work as well as you had hoped. Sometimes these ideas are complete failures and occasionally a prototype will work better than expected. The key point to remember is that you really don't know how well something is going to work until you test it by building a prototype. There are many different rapid prototyping processes to choose from. Which one you select depends on what you are trying to accomplish. If I am making a crude proof of concept model I want a process that is cheap and fast. In this case I might choose fused deposition modeling (FDM). When I need something more precise I will use one the higher end processes such as SLA or SLS. Rapid prototyping is the newest form of prototyping. There are other prototyping methods such as sculpting clay, machining parts and building your product by hand. These are still valuable and widely used techniques but so much more can be accomplished with new rapid prototyping processes. These new techniques are additive processes. This simply means the parts are built up in layers. What the layers are made of depends on the process chosen. There are many material options that you can choose from to fit any situation or material property. Depending on the process you choose, the parts can be very accurate and exact, creating parts very similar to injection molding. This makes rapid prototyping an excellent choice for creating models that look and operate like a fully finished product. Creating exact models can cut down on development time and ensure function and styling before going into production. There are many different types of rapid prototyping processes. A few of the most common are listed below. Stereolithography (SLA) is one of the oldest forms of rapid prototyping. This process uses a laser to cure a photosensitive resin to build your part. Excellent surface finishes can be achieved with the SLA process and there are many material properties that can be achieved as well. This is a great process for high quality prototypes and appearance models. Selective Laser Sintering (SLS) uses a laser to fuse powdered plastic together to form a part. The powdered plastics are typically either nylon or polycarbonate. These materials create strong parts that offer 90-95% of the material properties of the actual material. I have used the SLS process extensively in the past to test function models. 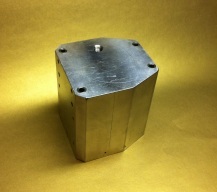 Fused Deposition Modeling (FDM) is a process that produces inexpensive parts. 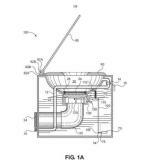 In this process a plastic rod is melted in layers to form a part. Of the processes described so far this one provides the lowest quality. 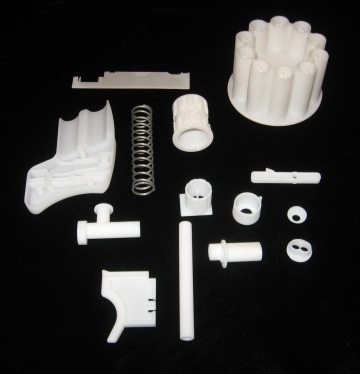 The parts have a rough finish and are less dimensionally accurate than either SLA or SLS. However the low cost makes them perfect for quickly and cheaply testing concepts and ideas. I have used FDM extensively in the past to find out quickly if an idea was going to work or if changes are required. 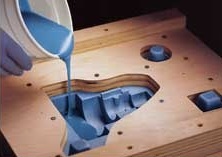 CNC Rapid Prototyping is a machining process that starts with a solid block of material. The material is loaded into a CNC machine that is programmed to remove the material required to create the part. CNC machining is similar to sculpting. A sculptor starts with a large piece of marble and removes everything that does not look like the object he is sculpting. CNC machining is similar except the range of materials that can be used includes plastics, metals, wood etc. The other difference is that the CNC rapid prototyping process is fully automated and can produce lots of accurate parts. Cast Urethane is a great process when you need multiple parts. The processes above are best suited to producing parts in quantities of 1-10 pieces. If you need more than 10 pieces a less expensive alternative is cast urethane. With this process, you can select from a wide variety of materials that will match most any application. Rapid Casting is rapid prototyping for metals. 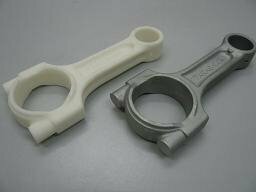 A relatively new process that is a combination of rapid prototyping to create a pattern and investment casting. Common materials include aluminum, steel and even titanium. There are many different options when it comes to rapid prototyping processes. Although not the only way to create a model or prototype of your invention, these processes are valuable tools that can be used to create many different types of prototypes. The process you select depends on your objective and needs.